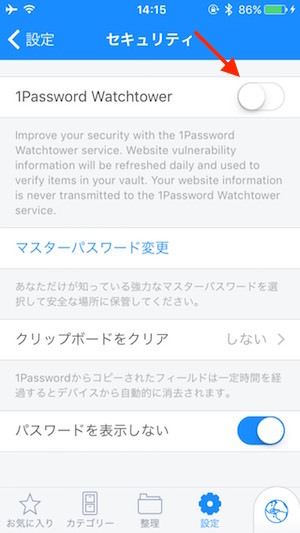 1Password for iOSがv6.2にアップデート。3D Touchの機能が追加され、Heartbleed脆弱性対策機能「Watchtower」が利用可能に。 | AAPL Ch. Improvements to search, including the added ability to find items from the Favorites and Organize tabs. Find out if any known security vulnerabilities might affect your accounts using Watchtower. Copy and move items from vault to vault. 3D Touch Quick Actions are available for compatible devices! Initiate search, view your favorites, or add an item from your iPhone 6S or 6S Plus home screen. Peek, Pop, and preview items in 1Password. If you want to speed things up and know the title of the item you’re looking for, make sure Search Titles is highlighted. 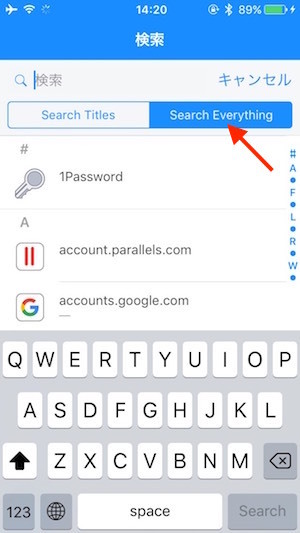 If you need to look through all of your fields, start your search and tap on Search Everything. You can also clear what you’ve typed into the field or cancel your search altogether with a single tap. I’m excited to tell you that Watchtower is now available in 1Password 6.2 for iOS! 1Password for Mac users will recognize this service, which monitors the latest security vulnerabilities from around the web and alerts you when your own accounts might need attention. If you want quickly look at an item, find it as you normally would. Instead of tapping on it, give it a light 3D Touch to take a Peek, then press a little harder to Pop into its details view. Or, Peek at an item, then swipe up to to copy a field or open a login in 1Browser.